Duck breast. Beer. Wild berries. What’s not to love? Nothing, if you eat this as a dish. This is one of those cases where the whole is greater than the sum of its parts. Taken separately, you’ll wonder what the fuss is all about. But together, this is a perfect balance of meaty, fatty, salty, tart, sweet and bitter. I owe my inspiration for this dish to an old Icelandic cookbook by the memorably named Nanna Rognvaldardottir called Icelandic Food & Cookery. 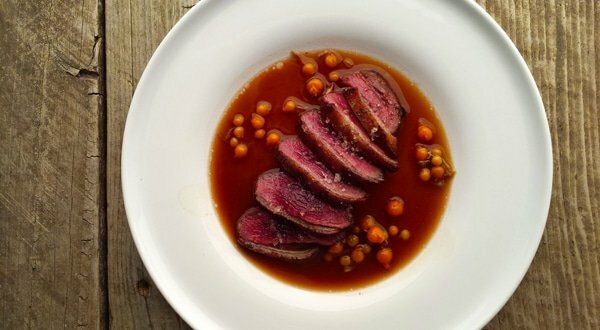 Her dish is done with wild goose, and geese would work perfectly well here; I used mallard breasts. Her dish is thicker, cooked longer and uses different berries. I lightened things up and cooked the meat a lot less, and added some preserved golden currants I picked in Nevada last summer. I am betting you don’t have preserved golden currants lying around your house, so I’ll give you some options below. The essence of this dish is the beer sauce. You marinate the duck (or goose) in a dark, malty beer — I used a weizenbock from Germany — plus some beer vinegar, which I wrote about earlier this week. Regular malt vinegar also works, but is less flavorful. Cooking with beer is different from cooking with wine. With wine, you need to worry about acidity and tannins ruining your dish. With beer, it’s bitterness. I’ve yet to cook with an imperial pale ale and be successful, although I dearly love drinking them. That’s why I call for a malty beer. Any malty beer will do: bock, porter, stout, Scottish ale, dunkelweizen or Belgian tripel. You might try this with a Belgian sour beer, too, for a different effect; my guess is you won’t need much added vinegar to balance it. After the meat rests in the marinade for a while, you boil it down with stock or broth to make what the French call a jus, but what I call a pan sauce. I use homemade duck stock, which isn’t too salty, but if you are using store-bought, get the low sodium kind and keep tabs on the sauce as it boils down — a salty broth can ruin it. The berries are a must. Without them, you get a deep sense of “there’s something missing” from this dish. No currants? I get it. They’re hard to find. Use cranberries, lingonberries, tart huckleberries or blueberries (not the overly sweet fat cultivated ones you normally get in the store), blackberries, raspberries or the like. The key is tart and just a little sweet. Oh, and if you use cranberries, let them boil in the sauce just until they begin to pop; cranberries need a little cooking. What to serve with this? My immediate thought was mashed celery root. Any mashed vegetable would be good here, from potatoes to parsnips to squash — and if you happen to have a squash that’s pretty sweet, you might be able to skip the berries. (if you try that, please let me know how it went in the comments section below, OK?) A more traditional offering might be some dark , crusty rye bread. And obviously this is beer food. Malty beer. 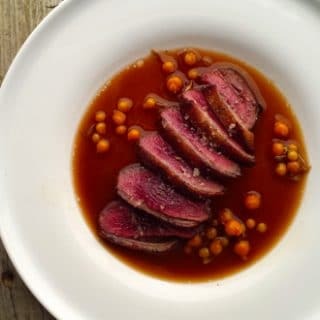 I used mallard breasts, preserved currants and a German weizenbock for this recipe, but you can substitute in what you have available. Domesticated duck, goose, or whatever -- but it needs to be a little fatty to balance out the sauce. I've already mentioned what sort of berries would work as alternates, and as for beer it just needs to be dark and malty, not hoppy. Oh, and the smoked salt? I really like what it adds to this dish. In a lidded container large enough to hold all the duck breasts in one layer, stir together the beer, onion, bay leaf, peppercorns, juniper berries, salt, and beer or malt vinegar. Add the duck breasts skin side up. Ideally, you keep the skin out of the marinade; this will help it crisp better later. Cover and refrigerate for at least 1 hour and up to overnight. Remove the duck breasts from the marinade and pat dry with paper towels. Pour the marinade in a pot with the 3 cups of stock and turn the heat to high. You want to boil this down 10 about 1 1/2 cups, for the pan sauce. 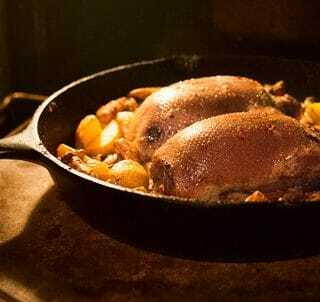 While the marinade is boiling, heat the duck fat in a large saute pan set over medium-high heat. Sear the duck breasts in the usual way, and set on a cutting board to rest. Taste the sauce as it boils down so it doesn't get too salty; store-bought broths and stocks can be really salty, and you don't want to ruin your sauce. It will be a little bitter -- that's the beer. Once the salt content is to your liking, turn off the heat and adjust with a little more beer vinegar. To serve, slice the duck breast and salt it with the smoked salt. 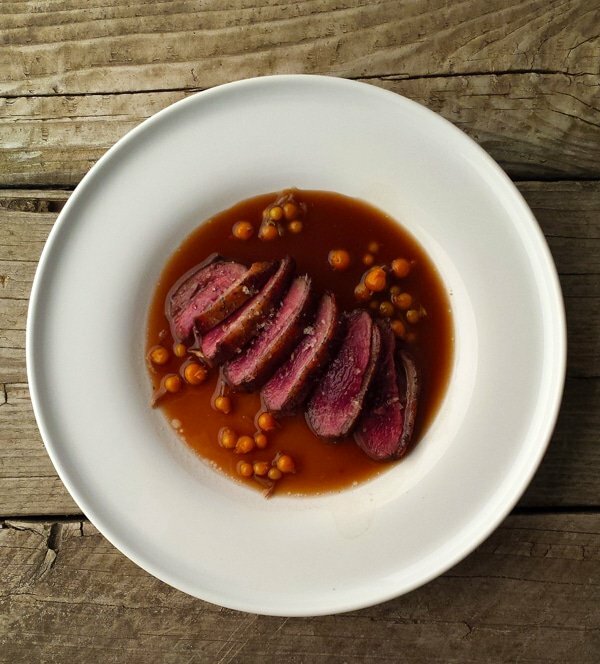 Pour some of the sauce down on the plate, top with the duck and toss a handful of berries on the plate. Serve with dark, crusty bread or with mashed root vegetables or potatoes. Explore nearly 100 recipes for all kinds of ducks and geese, wild and farmed, here on Hunter Angler Gardener Cook. Tom: Yep. I’ve eaten them, and yes, they’ll work nicely here. Hank, fresh out of duck breasts (OK, I didn’t have a chance to hunt this fall). However there were fresh venison streaks in the freezer and they worked just fine. We used blueberries we had frozen this summer and some butternut squash. The combination was fantastic! I will hope for some North Dakota mallards next fall and keep this receipt close. I don’t have duck stock (I purchased a duck breast from Whole Foods) and we don’t eat beef/pork due to an allergy. Would a deep roasted chicken stock work ok? Or another suggestion? Amber: Sure, a darker chicken stock will work.